Artificial reefs to increase fish yields or for algaculture have been used at least since 17th-century Japan, when rubble and rocks were used to grow kelp, while the earliest recorded construction of artificial reef in the United States is from the 1830s when logs from huts were used off the coast of South Carolina to improve fishing. Since at least the 1830s, US fishermen used interlaced logs to build artificial reefs. More recently, castaway junk, such as old refrigerators, shopping carts, ditched cars, out-of-service vending machines replaced the logs in ad hoc reefs. Officially sanctioned projects have incorporated decommissioned subway cars, vintage battle tanks, armored personnel carriers and oil drilling rigs. Artificial reefs tend to develop in more or less predictable stages. First, where an ocean current encounters a vertical structure, it can create a plankton-rich upwelling that provides a reliable feeding spot for small fish such as sardines and minnows, which draw in pelagic predators like bluefin tuna and sharks. Next come creatures seeking protection from the ocean's lethal openness—hole and crevice dwellers such as grouper, snapper, squirrelfish, eels, and triggerfish. Opportunistic predators such as jack and barracuda also appear, waiting for their prey to venture out. Over months and years the reef structure becomes encrusted with algae, tunicates, hard and soft corals, and sponges. Mineral accretion involves applying a low voltage current to a metallic structure to cause limestone to crystallize on the surface, to which coral planulae can attach and grow. The electric current also speeds post-attachment growth. EMA works like charging a battery with a positive pole, the cathode, and a negative pole, the anode. Applying electric current attracts various dissolved minerals to either the cathode or the anode. Chemical reactions take place at both poles. On the anode, bubbles of oxygen and chlorine gas form. These bubbles float to the surface and dissolve into the air. On the cathode, bubbles of hydrogen gas and a limestone precipitate appear. A coalition of scientists named the Global Coral Reef Alliance (GCRA) is developing a technique called the Biorock Process using mineral accretion for reef restoration, mariculture, and shoreline protection. Artificial surfing reefs have been created in several locations around the world. Supporters cite subsidiary benefits such as coastal protection, habitat enhancement and coastal research. The world's first attempt was made in El Segundo, near Los Angeles, in California. The next attempt was at Mosman Beach, Perth, Western Australia. This reef was constructed of large granite rocks placed in a pyramidal shape to form an appropriate breaking wave form that would suit surfers. An artificial reef constructed of over 400 massive, geotextile bags (each one larger than a bus) filled with sand was constructed in 2000 at Narrowneck on the Gold Coast of Queensland, Australia. This artificial reef had two objectives: stabilizing beach nourishment and improving surfing conditions. Europe's first artificial reef was approved in 2008. Construction began August 30, 2008, in Boscombe, Bournemouth, UK, and opened in November 2009. The multi-purpose reef was expected to create waves up to 30% larger and double the number of surfing days annually. Construction on this reef began in June 2008, and was completed in August 2009. Boscombe Reef was built from large sand-filled geotextile containers, totaling 13,000 cubic metres (460,000 cu ft). In the United States demanding coastal permitting requirements present major obstacles to building surfing reefs. The only reef built in the U.S. for surfing is southern California's "Pratte's Reef", which was constructed in 2000 and removed in 2008 as planned. Artificial surfing reefs typically resemble a "submerged breakwater", and proponents suggest benefits beyond surfing conditions. Many coastlines are subject to powerful waves that crash directly onshore. An artificial reef 150–300 yards (140–270 m) offshore might create surfing opportunities and, by dissipating wave energy, make swimming safer and reduce coastal erosion. According to The Ocean Conservancy, a Washington, D.C.-based environmental group, the Osbourne reef may be an indication that the benefits of artificial reefs need to be re-examined. Jack Sobel, a senior scientist at the group, has said "There's little evidence that artificial reefs have a net benefit," citing concerns such as toxicity from paint, plastics parts, etc., damage to ecosystems and concentrating fish into one place (worsening overfishing). Since reefs have been damaged by human caused environmental and ecological changes such as overfishing, people have started creating artificial reefs. Artificial reefs can show quick increases in local fish population rehabilitation, coral reef, and algae growth. Though the quick positive response that artificial reefs tend to show is often interpreted wrongly and the overall impact on the ecosystem is overlooked. Increased fish populations have not been thoroughly examined and it is so far proven that artificial reefs attract far more fish to be caught by fishermen than the amount of biomass that is actually produced by the artificial reef. James Bohnsack, a biologist with the National Marine Fisheries Service (NMFS) concluded artificial reefs don't actually increase fish populations, they simply concentrate fish and make them easier for fishermen to locate and catch. Artificial reefs generally serve merely as FAD’s (Fish Aggregating Devices) bringing in fish from natural reefs, to be caught on the man made landmark. It is proven that artificial reefs attract fish, though it is still uncertain whether or not they make up for the losses, and further research must be done. The fish attracted and brought in to the artificial reef zones vary from reef to reef, and many times artificial reefs do in fact attract more fish than natural surrounding reefs. The fish that the reef will attract depends largely on the age, size and structure of the artificial reef. Different reefs attract different types of fish and large reef structures like the artificial reefs created by sinking large ships attract larger fish. In addition to attracting certain fish based on the structure of the artificial reef, the structure of the natural existing reef effects the impact of the artificial reef as well. It was found that the use of shipwrecks to create artificial reefs in rocky zones created a new trophic structure and changed the local reefs ecosystem. The large steel shipwrecks served as the home for certain species of marine life and all the species nearby migrated to the shipwreck. This created an unbalance in the natural ecosystem and altered many different marine lives habitats because of the altered state of the old natural reef. There may be many other artificial reefs worldwide that are negatively impacting the natural reef in the same way. There are thousands of popular wreck diving sites throughout the world built around shipwrecks sunk as artificial reefs. Some of these artificial wrecks are sunk deliberately to attract divers. Such wrecks as USS Spiegel Grove and USS Oriskany in Florida, USS Indra and USS Aeolus in North Carolina, and Bianca C in Grenada draw thousands of divers annually. Many ships and other unnaturally composed structures such as old tires are often used for constructing artificial reefs. The materials used in most artificial reefs are also likely to cause pollution by the releasing of excessive amounts of chemicals and nutrients that are not naturally found in reef environments. Retired naval vessels can release Polychlorinated Byphenyls (PCBs), asbestos, iron, lead paint and anti-fouling paint which leaches into the ocean and becomes part of the food-chain. Dumping tires into the ocean is a practice used to create many artificial reefs and a great example of the possibility that there are unseen dangers in creating artificial reefs . 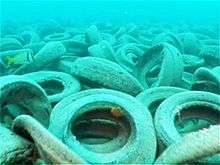 With millions of tires produced every year creating artificial reefs with them seemed like a great idea and was practiced around the world. Using trash to try and better the environment seemed like a great idea, but unfortunately, some of the reefs did much more harm than good. In Florida alone, 571 permitted artificial reefs exist and the number of illegal reefs is thought to be much greater. Using old products, such as tires, is taking possible risks and many marine biologists are skeptical about the amount of positive impacts that these reefs will have. Artificial reefs continue to be constructed around the world despite inconclusive studies and the high risks associated with them. Tires are widely used and need to be disposed of, thus they would make a great artificial reef construction material provided they don’t release pollutants. Tires are made from many chemicals and compounds, all varying. Tires are made differently by each manufacturer, the tires aren't all made the same and can contain many chemicals such as black carbon, sulphur, zinc oxide, and peroxides. Tire rubber formulas still undergo change and there is a huge variety in their material composition. The US National Artificial Reef Plan states that tires are a good reef construction material because there have been no toxic effects released from the decomposition of tires; though there is little information published to back up the claims and the future decomposing of the many different types of rubber tires could create unseen pollution. The use of tires has fallen out of favor with marine biologists. Tropical storms wash tires onto beaches, destroy nearby coral reefs and inhibit new coral growth. As a result, states such as Florida and the country of France have begun large scale removal of tire reefs. One example is the Osborne Reef off the coast of Fort Lauderdale, Florida. Storms broke the nylon straps holding the tire bundles together and boaters were allowed to dump used tires at the site. Since 2007 approximately 130,000 of an estimated 700,000 tires have been removed. At other artificial reef sites hurricanes pushed tires up on beaches from Florida to North Carolina, damaging reefs, causing pollution and requiring costly cleanup. As a result, the Ocean Conservancy now includes tire removal during the International Coastal Cleanup in September of each year. Neptune Reef was originally conceived as an art project that would gradually decay. Burial at sea became a way of financing the project. As of 2011, about 200 "placements" had occurred. Cremated remains are mixed with cement and either encased in columns or molded into sea-star, brain-coral, 15 feet (4.6 m) castings of lions or other shapes before entering the water. The second-largest artificial reef is USNS Hoyt S. Vandenberg, a former World War II era troop transport that served as a spacecraft tracking ship after the war. The Vandenberg was scuttled seven miles off Key West on May 27, 2009, in 140 feet (43 m) of clear water. Supporters expect the ship to draw recreational divers away from natural reefs, allowing those reefs to recover from damage from overuse. The site of ex-Spiegel Grove is located on Dixie Shoal, 6 miles (9.7 km) off the Florida Keys in the Florida Keys National Marine Sanctuary. Her exact location is 25°04′00.23″N 80°18′00.7″W﻿ / ﻿25.0667306°N 80.300194°W﻿ / 25.0667306; -80.300194. USCGC Spar was scuttled in October 2004 in 108 feet (33 m) of water, 30 miles (48 km) off Morehead City, North Carolina, where she now serves as an artificial reef. Surplus Redbird cars pass under the George Washington Bridge on the way to being sunk to form an artificial reef. In late 2000, the MTA New York City Transit decided to phase out an outdated fleet of subway cars to make room for new R142 and R142A trains. The obsolete subway cars, (nicknamed "Redbirds"), had run on the IRT lines in the New York City Subway system for 40 years. Each car was stripped, decontaminated, loaded on a barge, and sunk in the Atlantic Ocean off the coast of Delaware. Some cars had number plates removed because of rust, which were then auctioned off on eBay. A total of 1200 subway cars were sunk for this project. In September 2007, the MTA approved a further contract worth $6 million, to send 1600 of its retired subway cars to be used as artificial reefs. Most of these trains had run on the BMT/IND lines. The trains included the R32, R38, R40, and R42. The MTA has replaced them with the R160A and R160B trains. The old models were sheathed in stainless steel, except for the plastic front ends, which were removed before sinking. The retired fleet included old work trains and cars damaged beyond repair. Since November 2009, artist Jason deCaires Taylor has created more than 400 life size sculptures off the coast of Cancun, Mexico. The coral reefs in this region suffered heavy degradation due to repetitive hurricane abuse. This project funded by The National Marine Park and the Cancun Nautical Association was designed to emulate coral reefs using a neutral ph clay. Taylor has constructed unique settings depicting daily activities ranging from a man watching TV to a 1970s replica of a Volkswagen Beetle. This artificial reef has relieved pressure from the nearby Manchones Reef. The design and materials implemented in this project have proved the ecological viability of artificial reefs. The Gibraltar Reef was first proposed by Dr. Eric Shaw in 1973. Initial experiments with tires proved unsuccessful as the tires were simply swept away by currents or buried underneath sand. In 1974, boats from local marinas and the Gibraltar Port Authority were donated. The first two were barges that were sunk in Camp Bay. In 2006, a 65-ton wooden boat, True Joy (also referred to as Noah's Ark) was sunk here as well, followed by MV New Flame, a mid-sized bulk carrier, in 2007. In 2013, a dropping of more than 70 concrete blocks, each one square meter with metal bars, took place. This led to heated debate between the United Kingdom and Spain, with Gibraltar accusing Spain of over forty incursions into their waters per month and Spain accusing Gibraltar of including metal bars in the reef to stop Spanish fishermen trawling the seabed for fish. The dropping led to a diplomatic conflict between the Kingdom of Spain and the United Kingdom due to Gibraltar being a British Overseas Territory. It is an artificial reef off the coast of Pondicherry, India constructed of fully recycled materials such as concrete, rocks, trees, palms, and iron bars. It is located at the depth of 18 metres (59 ft). It is also there in Kovalam, Kerala. It is built there to promote surfing. Pearl of Dubai is an art inspired Lost City variant artificial reef off the coast of Dubai. The site encompasses five acres in total and is located at the World Islands. Located at a depth of 10 to 20 metres (33 to 66 ft), the site is designed as an ancient lost city, complete with temples and statues using regional design cues from 800 BC. The Underwater Chocolate Hills is an artificial reef project being undertaken by Spindrift Reefs Dive Center off the coast of Panglao Island in the Philippines. They are using broken coral harvested by local divers, who are in turn attaching it to wire structures underwater. The structures are unique in that they are built in the same shape as the Chocolate Hills which can be found in the Bohol Region. This is being done to build a new dive site and new marine habitat for the area. ↑ Williams, Thomas Wayne. A Case Study of Artificial Reef Decision-Making in the Florida Keys (pdf). Virginia Commonwealth University. Retrieved 20 December 2006. Archived May 30, 2008, at the Wayback Machine. ↑ Hess, Ron; Rushworth, Denis; Hynes, Michael V.; Peters, John E. "Disposal Options for Ships" (PDF). Rand Corporation. Archived from the original (pdf) on June 29, 2007. Retrieved 20 December 2006. ↑ "Fisheries Technologies for Developing Countries". National Academies Press. Retrieved 20 December 2006. ↑ "Guidelines For Marine Artificial Reef Materials" (PDF). Gulf States Marine Fisheries Commission. Archived from the original (pdf) on January 10, 2007. Retrieved 20 December 2006. 1 2 3 4 "Artificial Reefs". National Geographic. February 2011. Retrieved 5 April 2015. 1 2 "Biorock Benefits" (pdf). Global Coral Reef Alliance. July 2014. Retrieved 5 April 2015. ↑ "Optimism at Boscombe surf reef's opening day". Bournemouthecho.co.uk. 3 November 2009. Archived from the original on March 18, 2012. Retrieved 19 June 2012. ↑ Fontaine, Evan (2008-10-11). "SANDBAGGED After years of unspectacular closeouts, Pratte's Reef is removed from El Segundo". Surfline. Retrieved 2012-03-05. ↑ Loney, Jim (9 July 2007). "Florida Raises Ill-Fated Artificial Reefs". Enn.com. Reuters. Retrieved 5 April 2015. ↑ Thiony Simon, JeanChristophe Joyeux, Hudson T. Pinheiro, Fish assemblages on shipwrecks and natural rocky reefs strongly differ in trophic structure, Marine Environmental Research, Volume 90, September 2013, Pages 5565, ISSN 0141-1136. ↑ "Wrecks and Obstructions Database". NOAA. ↑ Gerken, Michael. "Top 10 Wreck Dives of North Carolina". Scuba Diving. Retrieved 8 March 2016. ↑ Jacobson, Lester. "Artificial Reefs, Sunken Ships, and Military Toxins". Toxipedia. Retrieved 11 August 2016. ↑ Allen, Greg (5 July 2007). "Fallout from Bad '70s Idea: Auto Tires in Ocean Reef". NPR. Retrieved 8 March 2016. ↑ Fleshler, David (15 May 2015). "Fixing a catastrophe: Divers removing 90,000 tires from ocean". Sun Sentinel. Retrieved 8 March 2016. ↑ Ferrer, Sandra (22 May 2015). "France hits reverse on sinking tyres for artificial reefs". Phys.org. Retrieved 8 March 2016. ↑ Fleshler, David (30 June 2016). "Push is on to remove thousands of tires on ocean floor in Fort Lauderdale". Sun Sentinel. Retrieved 4 July 2016. ↑ "The Osborne Tire Reef". projectbaseline.org. Project Baseline. Retrieved 14 March 2016. ↑ Peppard, Jim (21 August 2009). "Florida tire reef removal ends for the year". St. Petersburg, Florida: WTSP. Archived from the original on 1 December 2010. Retrieved 5 April 2015. ↑ Olsen, Erik (18 August 2008). "Out of Commission Above Water, but Not Below It". New York Times. Retrieved 5 April 2015. 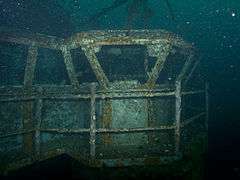 ↑ "WWII-era ship becomes sunken reef off Key West". AT&T Online News. 27 May 2009. Retrieved 18 July 2009. ↑ "Ship to Become 2nd Largest Intentional Reef". New York Times. Associated Press. 25 May 2009. Retrieved 25 May 2009. ↑ Hudy, Paul. "North Carolina Shipwrecks". nc-wreckdiving.com. Retrieved 15 July 2015. ↑ Mobile Riverine Force Association (October 4, 1999). "History of The USS Indra (ARL-37)". Retrieved October 20, 2014. ↑ "Cancun’s Underwater Museum Blooms In Time For Spring". Cancun Visitors Bureau. Retrieved 15 November 2012. ↑ "HMAS Swan - History". Michael McFayden's Scuba Diving Web Site. Retrieved 5 April 2015. ↑ "Welcome to the official former HMAS Perth Website". Archived from the original on March 20, 2012. Retrieved 12 July 2012. ↑ "Dive the Ex-HMAS Hobart". Archived from the original on 27 February 2015. Retrieved 5 April 2015. ↑ "Ex-HMAS Brisbane Conservation Park". Archived from the original on May 11, 2012. Retrieved 12 July 2012. ↑ "ex-HMAS Canberra Reef". Dive the HMAS Canberra. Retrieved 5 April 2015. ↑ Bennett, Owen (19 November 2013). "Gibraltar: We are just one shot away from military conflict, warns MP amid new standoff". Daily Express. Retrieved 5 April 2015. ↑ Kim, Soo (1 July 2014). "The world's largest underwater theme park planned in Dubai". The Telegraph. Retrieved 5 April 2015. ↑ "Spindrift Reefs Dive Center".